I did 2" level with that same tire but a BFG KO and I love the way it looks. Didn't touch the rear. Paint protection film (xpel / suntek) worth the cost? I had mine done before I took possession from the dealer. Cost was around that $800 mark. Mine is a '15 GMC All Terrain in blue and it has the fully painted front end.I do not have 1 rock chip in it! I recently saw it's twin at a local dealer so I stopped in to check it out, the front bumper had several bad chips in it, and the front end/hood had a few. SO I'm very happy with the $800 I spent to have mine still look new! Worth every penny as far as I'm concerned!! Who has a 4" BDS lift? GMC Sierra. I like the looks of the painted moldings. Anyone done a blue one? Maybe I'll be the first?? Nice! Like the flares, looking good! 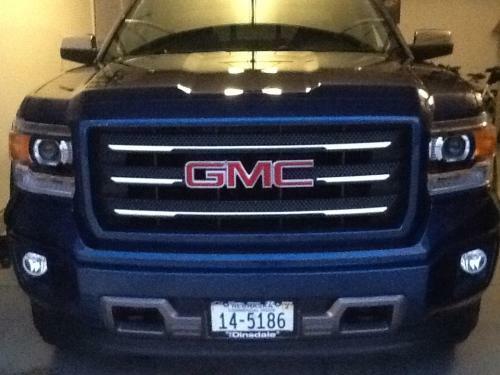 Has anyone painted their GMC fender trim blue? Would love to see some pictures of it, or pictures of cooler coordinated fender flares. Thinking I would like to do it to my A/T??? I'm interested in your DIY where is it located? If Chevy had built them like this I may have bought one, instead of my GMC AT! Love what you did to the front end! Now paint the rear bumper!